Irene Park, July 14, 2017, 9:29 a.m.
Korea is the world's eighth-fittest country as measured by walking activity, according to a new global study released this week. Hong Kong came out on top, its residents walking more than any other people in the world. Researchers at Stanford University in the U.S. studied 693,806 people in 46 countries from July 2013 to December 2014 using a step-counter app installed in their smartphones. They found that people in Hong Kong took an average of 6,880 steps a day. Chinese ranked second with 6,189 steps, followed by Ukrainians (6,107), Japanese (6,010), Russians (5,969), Spaniards (5,936) and Swedes (5,863). 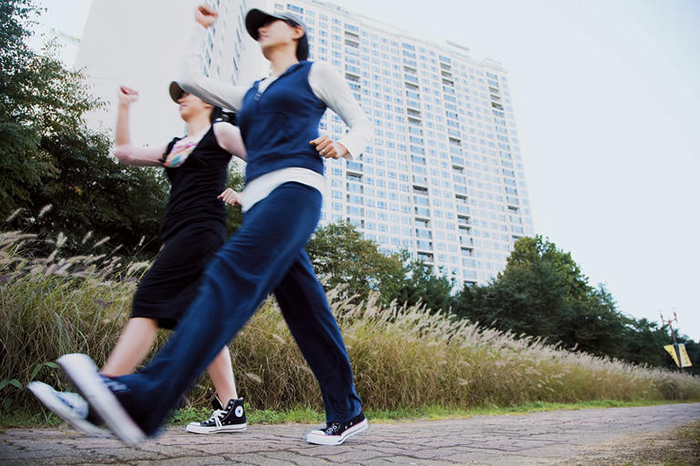 Koreans were in eighth place with an average of 5,755 steps. Indonesians walked the least, with 3,513 steps. Saudis (3,807) and Malaysians (3,963) were second and third last. The global average was 4,961 steps. In East Asian countries like China, Japan, Hong Kong and Korea, people generally walked a lot and had low rates of obesity. Furthermore, the high walking rates were evenly distributed throughout the populations of these countries.